Nobody should be deceived into thinking that God looks on unconcerned as a devil incarnate usurper enjoys... Sometimes God grants prosperity to wicked men in displeasure; yet they flourish but for a moment (Psalm 92:7). Readers would recall that I indicated in one of my articles (titled Father Afful-Broni— The Lucifer Fanning the Flames of UEW Impasse of March 2, 2018) that Rev. Fr. Prof. Anthony Afful-Broni consented to a powerful diviner’s idea to sacrifice the lives of three staff members of UEW before he could become the Vice-Chancellor (VC). How that came to pass is common knowledge. I do not intend to remind the grieving families of their deep and painful loses but allow me to refresh your memory a bit. Father Afful-Broni’s first victim was a Senior Lecturer and Acting Head of Department (HOD); the second was a Principal of one of the university’s colleges; and the third was a secretary in the office of the VC. Given that all well-meaning Ghanaians are demanding the dismissal of Afful-Broni, this article seeks to caution staff and students of UEW to be wary of this Old Nick who calls himself a reverend father, as he certainly would want to wreak some more havoc to help him retain the usurped VC seat. Seeing that he has no credibility left after he was exposed for being a traitor and corrupt, Afful-Broni has now resorted to paying journalists in order to paint him good. Sadly, everybody knows that Rev. Fr. Prof. Anthony Afful-Broni is a man of cold-cruelty, power-lust and appalling life-form ever to pollute our world. He has managed to carve for himself a ‘kingdom’ where funds are always streaming in for his discretional use. Mind you, the GHC 5.7 million he paid himself as honorarium comes from just one of UEW’s eight banks—i.e. GCB Bank Limited. Monies he appropriated from the seven other banks are yet to be ascertained. Also, on the premises of the St. John’s Catholic Church at the North Campus of the university, the daemon has diverted church funds to put up a personal residence into which he intends to retire for the rest of his life. The late Acting Director of Security—one of Afful-Broni’s victims, in his last words before his death, warned Afful-Broni to be reminded that there was an end to everything. Certainly, the heartaches, the wailings, the groaning from the body pains and aches of the over 30 different categories of staff Afful-Broni arbitrary sacked will not be in vain. Anyway, anyone who saw him [Afful-Broni] lately could easily tell how away with the fairies he had become. He is being haunted by his own iniquitous deeds including the innocent lives he has taken. No wonder, he has surrounded himself with the likes of Bawah the psycho, the morally-corrupt Birikorang and cuckoos like Kankam, Yirenkyi, Nketsiah, Amponsah, Dampson, Mensah, and Appiah. These questionable characters, having benefitted from dubious appointments and promotions, think the best way to reward their master is to coerce other lecturers, especially the newly recruited ones to sign a petition to back the devil’s continuous stay; to hold senseless press conferences in support of him; and to threaten other staff members and students with dismissal if they do not openly declare support for the master of Hell. Enough with this! Rev. Fr. Prof. Anthony Afful-Broni must go!! 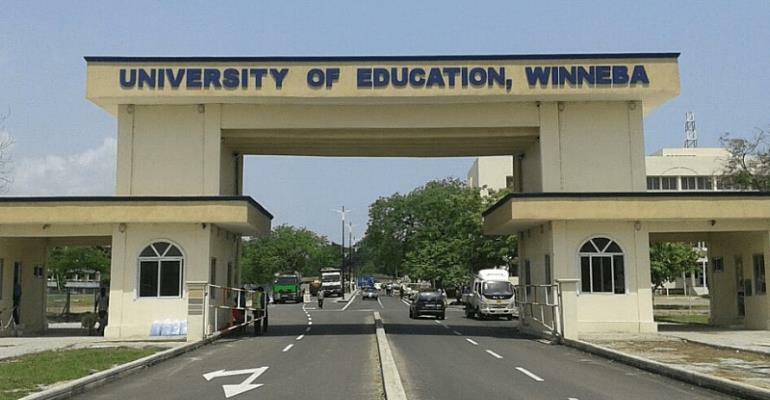 UEW deserves better!! !